Incorporated July 29, 1971. The club has 78 acres, 3 wildlife ponds, two full outdoor courses, 4 elevated tree stands and an indoor shooting area with 10 lanes. *There's an adult outdoor broadhead league from May through August on Tuesdays. 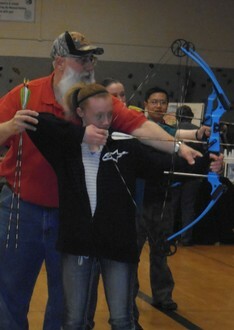 An adult indoor bowhunter league from December through March on Tuesdays. *A youth league for 10 weeks starting in January on Saturday mornings. The club has approximately 200 members. Current membership costs, $30.00 family, $25.00 single, and $5.00 students. Open indoor practice on Mondays and Fridays, December thru March. Board meetings are the second Wednesday of each month. The open indoor shoot is run the second weekend of February. Our club member carp shoot is held on Father's Day weekend in June. Open outdoor 3D and broadhead shoot is held the second weekend of August. "The archer ceases to be conscious of himself as the one who is engaged in hitting the bull's-eye which confronts him. This state of unconscious is realized only when, completely empty and rid of the self, he becomes one with the perfecting of his technical skill, though there is in it something of a quite different order which cannot be attained by any progressive study of the art..."